Of course, PM Netanyahu denied saying it, and Linde indicated that he had actually been paraphrasing the PM’s statement, not quoting it exactly. And I’m sure that nobody expects Israel to bomb Ha’aretz or invade Times Square. Everyone knows who Israel’s main enemies are. But in a sense, we also know what he was getting at. While — at least so far — Israel has been capable of defeating its Arab enemies on the battlefield, it is particularly inept at countering the information war being waged against it, in part by the anti-Zionist Left. Netanyahu knows that unless something unlikely and unforeseen happens, the moment will come when he will have to order the IDF to attack the Iranian nuclear complex. This is the last thing he wants to do — or rather, it is the second last, the last being to become aware that Iran has deliverable atomic weapons. He knows that such an attack will be followed by retaliation which will undoubtedly kill many Israelis, despite the plans of the IDF to take out Hizballah’s rockets, neuter Hamas and deter Syria, and despite Israel’s well-developed missile defense capabilities. He knows that the only thing worse than making the decision too early will be making it too late. It is reminiscent of the decision faced by Eshkol, Dayan and Rabin on the eve of the Six Days War. So it doesn’t help when the Times publishes op-eds suggesting that the best way to solve the problem of Iranian nukes is for Israel to give up its own nuclear deterrent. He is pressured on other fronts, too, as by a European diplomatic assault to force Israel to evacuate the area east of the Green line, which would effectively allow it to become a terrorist base. And speaking of terrorist bases, there is the increasingly dangerous condition of the Sinai peninsula, which has become a no-man’s land for multiple radical groups. He really doesn’t need — just one striking example — for US decision-makers to read top Times columnist Tom Friedman saying that the standing ovation he received in Congress was “bought and paid for by the Israel lobby,” or, for that matter, anything about Israel written by Friedman, Roger Cohen or Nicholas Kristoff. Ha’aretz is worse, if possible. Its staff includes Gideon Levy, Amira Hass and Akiva Eldar, who simply echo the Arab narrative in which Israel is a racist apartheid war-criminal state, which should never have been created. Because it is an Israeli newspaper — with an elaborate, up-to-date English website — it is often quoted as representative of opinion in the country, whereas its positions are actually shared only by a small minority of Israelis on the far Left. Both of these organs are considered the ‘newspaper of record’ in their respective countries, and as Netanyahu noted, their views are repeated by journalists around the world. This is how the campaign to delegitimize Israel — to paint it as a criminal among nations, a rogue state, a state which is forbidden to defend itself — is fed every day. From the top. This entry was posted on Thursday, January 19th, 2012 at 4:42 pm and is filed under Media. You can follow any responses to this entry through the RSS 2.0 feed. Both comments and pings are currently closed. This piece tells an important truth about the two most important mainstream enemies of Israel, ‘The New York Times’ and ‘Haaretz’. 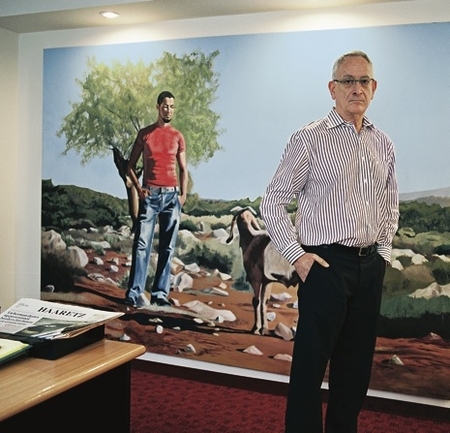 It also contains a picture of the main contractor behind the longstanding anti- Israel slant of ‘Haaretz’ Amos Schocken. Unfortunately there does not seem any short- term way the editorial line of these newspapers is about to change.